An ancient healing art, acupressure enhances a dog’s comfort, emotional stability and physical health without the use of needles like acupuncture. Animal acupressure practitioners Amy Snow and Nancy Zidonis define acupoints as “pools of energy located along meridians that are used to balance energy.” The meridian system carries Chi (pronounced "Chee") energy to all parts of the body to establish vitality. When the body’s Chi or “life-force energy” is imbalanced due to a blocked or congested meridian path, disease can set in. Acupressure reestablishes positive Chi energy flow. Acupressure practitioners start at the top of the ear and work to the bottom. One hand works the points, while the other rests near the base of the ear to provide support or feel for reactions to the work. Pressure is gently applied at a 90-degree angle to the meridian line located along the ear for about 30 seconds, Snow says. The index finger and thumb are used to work along the ear flaps. Acupressure sessions begin by massaging the ears. The ear flaps are gently pulled away from the base and stretched the sideways. An acupressure practitioner repeats this stroking motion several times on both ears until signs of release like yawning or licking occurs. Ear Acupoint 1: The Tip of the Ear or "Shock Point"
The tip of the ear or "shock point" is one of the most prevalent points to work following an accident or trauma and is used to prevent a dog from going into shock. An acupressure practitioner puts direct pressure at the tips of the ear--one at a time--and alternates the point work to counter intense stress. This method can be performed on the way to a veterinarian's office for trauma. By synchronizing her breathing with the dog’s respirations, the acupressurist promotes relaxation as she holds the point. This technique can also speed recovery following surgery or assist an epileptic dog by reducing the frequency and intensity of seizures. Located halfway down the interior areas of both ears, closest to the crown of the head and about a half inch toward the center of the ears are the stifle (knee) joint acupoints. Pressure applied to this point promotes relieves arthritis in the geriatric canine, or the young dog that has torn a cruciate ligament or injured its knee. Located one-third up from the base of the ears on the outside of the ears are the nose or sinus acupoints. Practitioners apply gentle, but intentional pressure to these points to help clear upper respiratory infections, as long as a high fever does not accompany the infection. "The ear flaps and outer ear areas are a hologram for the entire body,” says Buddha Dog. “The triple heater meridian, the traffic controller of the body, encircles the ear flap. Massaging the ear and the flap will relax and invigorate all the organs of the body.” Numerous ear acupoints correspond to the liver, kidneys, heart and reproductive organs via the triple heater meridian that runs through the ears and connects to other major meridians in the animal's body. Acupressure treatment should not be given just after a dog has eaten; three to four hours should be allowed before a session. 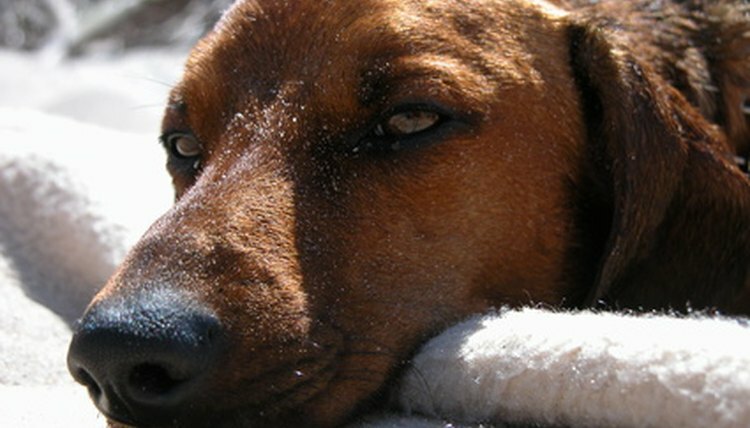 Following rigorous exercise, a dog should cool down before receiving treatment. When a high fever or infectious disease is present, avoid acupressure.